It’s pretty hard for a team to be a bigger disappointment than the Edmonton Oilers were this year. Coming off a tough Game 7 loss in the second round of last year’s playoffs, this year’s squad—led by the attractive young duo of Connor McDavid and Leon Draisaitl, plus a potentially great defenseman in 23-year-old Darnell Nurse—was a trendy pick for a deep postseason run. Instead, the Oilers finished closer to last place than to a playoff spot, completely wasting a transcendent 108-point season from McDavid. 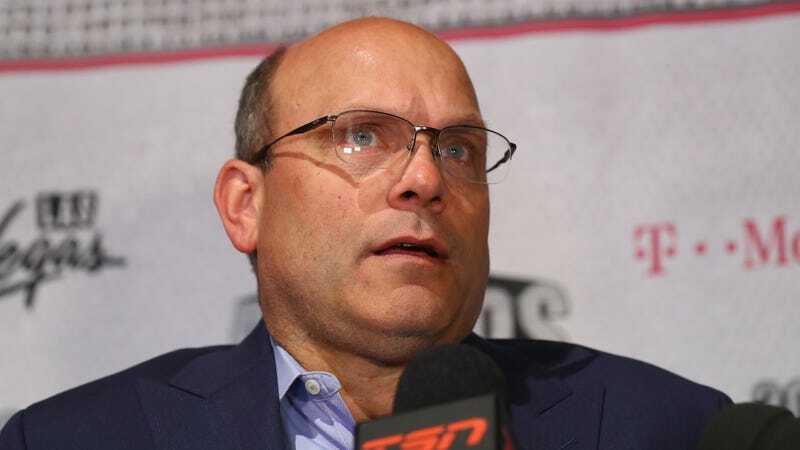 Still, the consequences for this failure will be, at most, a coaching change, as team CEO Bob Nicholson announced Thursday that GM Peter Chiarelli’s job is safe for at least another year. On one hand, keeping a GM just one year removed from his franchise’s best season in a generation seems like a reasonable decision. In retrospect, however, it’s clear that Stanley Cup expectations were far too optimistic for this deeply flawed roster, and Chiarelli’s track record as an architect gives almost no hope for the future. Despite McDavid’s MVP-caliber year, and Draisaitl’s able work as the Malkin to his Crosby, the Oilers have very little promising talent to work with. Patrick Maroon, one of their strongest veteran presences, got shipped to New Jersey at the deadline. Ryan Nugent-Hopkins puts up impressive stats but only works as a Jake Guentzel-esque sidekick. Milan Lucic, who Chiarelli signed to seven years/$42 million in 2016, is quickly spiraling out of his prime. Highly touted defenseman Oscar Klefbom took a step backward this year following his first full season in the NHL. Almost everyone else is just actively bad, save the guys like teenaged winger Kailer Yamamoto who haven’t had enough ice time to warrant a judgement. It’s pretty clear that 2016-17 was the anomalous season, not this one. It’s startling to think just how awful this team would have been if McDavid had suffered an injury, or even if Draisaitl or Nurse had to miss significant time. And even if it’s beating a dead horse at this point, imagining what an Edmonton squad could look like if Chiarelli hadn’t lost almost every trade he’s made is mouthwatering. But somehow, the guy up top is back, even though Nicholson was frustratingly vague with any real reasoning for retaining Chiarelli. “I talked to Peter and he has a plan to get us back in the playoffs next season, and we’ll unveil that plan once we go through this evaluation,” Nicholson said. “Peter really thinks through everything that he does. I really believe that he understands where our gaps were this year,” he added. At this point, it’s difficult to come up with a strong argument for why Chiarelli—whose former team in Boston is only now recovering from the damage he inflicted at the end of his tenure—still should have a job as coveted as Edmonton’s is. Even with the baggage of the Lucic deal and the lack of a cornerstone goaltender, an actually talented GM has the pieces to build something special. For the Oilers to stick with someone as lackluster as Chiarelli just smacks of the same lazy leadership that turned Edmonton’s last decade into a blank void of tanking without payoff. There has to be someone better out there, and Connor McDavid deserves that person.